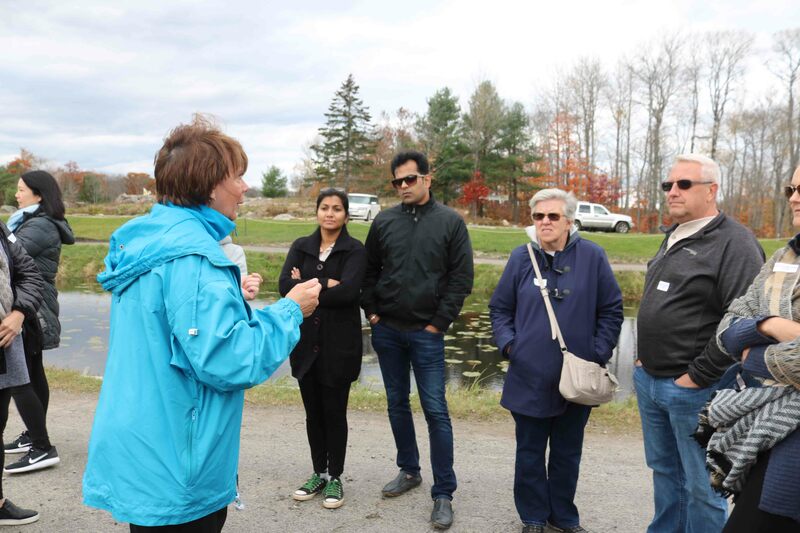 On October 24, 2017, we travelled to Bala in Muskoka Region of Ontario to visit Johnston’s Cranberry Marsh. Johnston and his wife, Wendy Hogarth, now run the oldest commercial cranberry farm in Ontario. The farm was founded in 1950 by Johnston’s father, Orville, and his wife June. 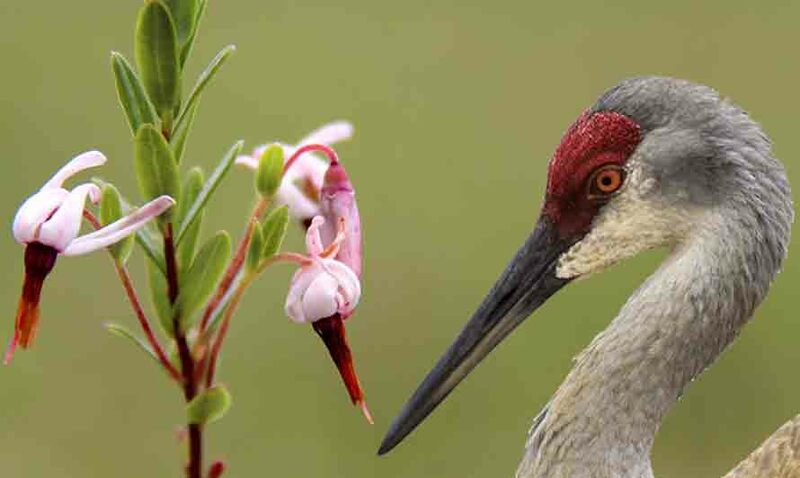 The early settlers from Europe called it ‘crane berry’ as the shape of the blossom resembles the head of a crane. Over time, they dropped the ‘e’ and the fruit came to be called cranberry. Captain Henry Hall was the first to successfully cultivate cranberries with the first documented harvest occurring in 1816 in Dennis, Massachusetts, USA. William MacNeil planted Canada’s first commercial cranberry farm in Nova Scotia in 1870. Cranberry is a native fruit of Canada. The vines on which the cranberry grows is very hardy and can easily survive a Canadian winter. The fruit is packed with antioxidants and other healthy plant chemicals. Cranberry got a boost in the early 1990s when scientists at Harvard University found that drinking cranberry juice was a natural way of preventing and relieving Urinary Tract Infections (UTI). Then came research that said cranberries helped to keep the arteries healthy, are a good source of vitamin C and may even help to prevent cancer. This resulted in most retail grocery stores selling cranberry and various other cranberry related products like juices, crasins (dried cranberries), sauces, capsules, etc. The cranberry vines grow in bogs. These bogs evolved from deposits left by the glaciers more than 10,000 years ago. These deposits were left in low lying areas lined with clay. The clay prevents materials from leaching into the groundwater. As the glaciers receded after the ice age, they deposited peat, sand and moss in these low lying areas, creating a marshy land. 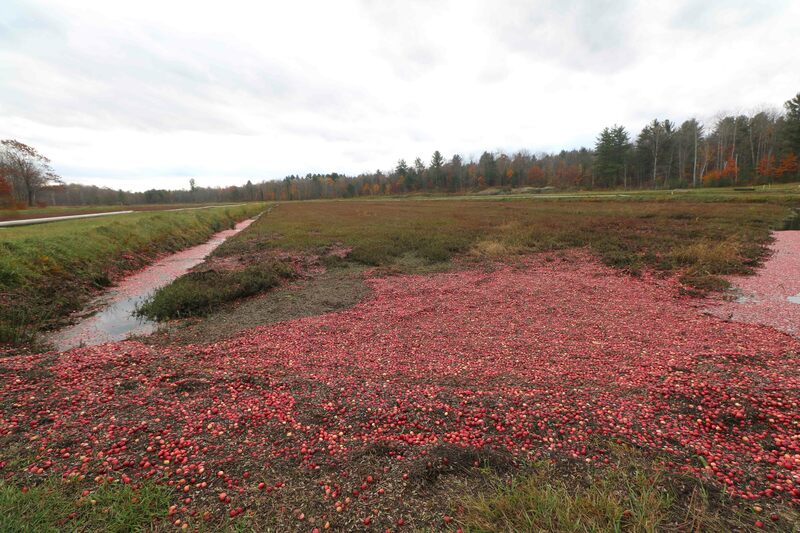 Cranberries thrive best in these bogs, which consist of alternating layers of sand, peat, gravel and clay. 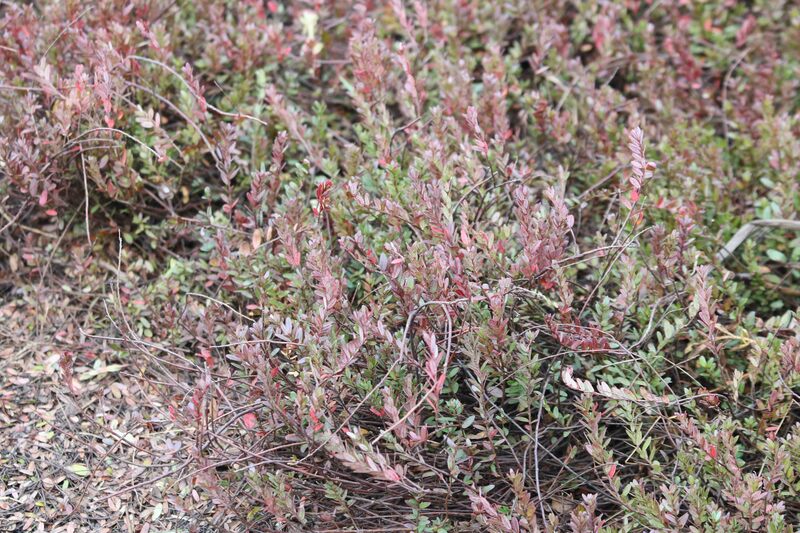 Cranberry vines produce horizontal stems called runners that may grow up to 2 meters long and spread profusely over the bog’s floor. The runners spread along the ground and would rise only a foot above. The fruit grows at the lower side of the runners and hence picking it is a difficult job. 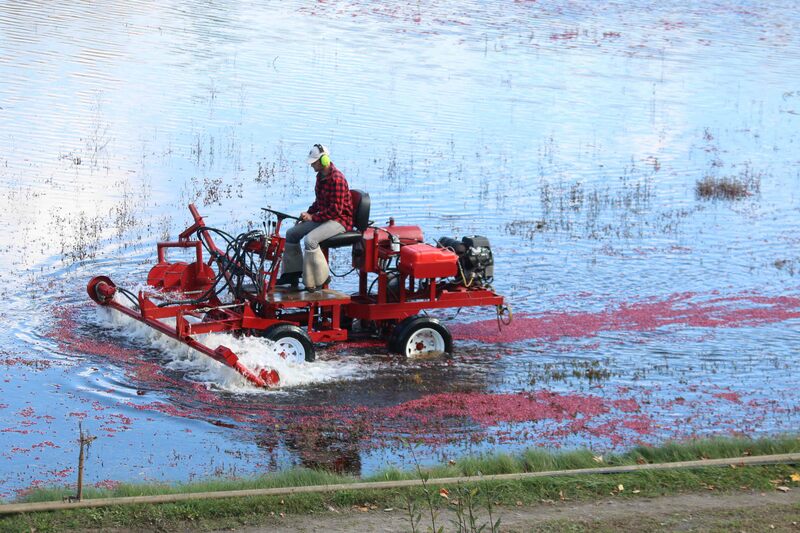 Cranberry growing season extends from April to October. Thus it is often the last of the fruits to be harvested in Ontario. Many people believe that cranberries are grown in water. The berries are mostly depicted floating on top of the water during harvest. The vines flower in early spring, but the chill of the Canadian Spring may damage them. To prevent this damage, the bogs are flooded to ensure that the blooms and the tender buds are not exposed to the cold. The vines need to be irrigated all through their growing season. There is an extensive network of pumps and pipelines, coupled with water reservoirs controlled with floodgates all through the farm for irrigation. 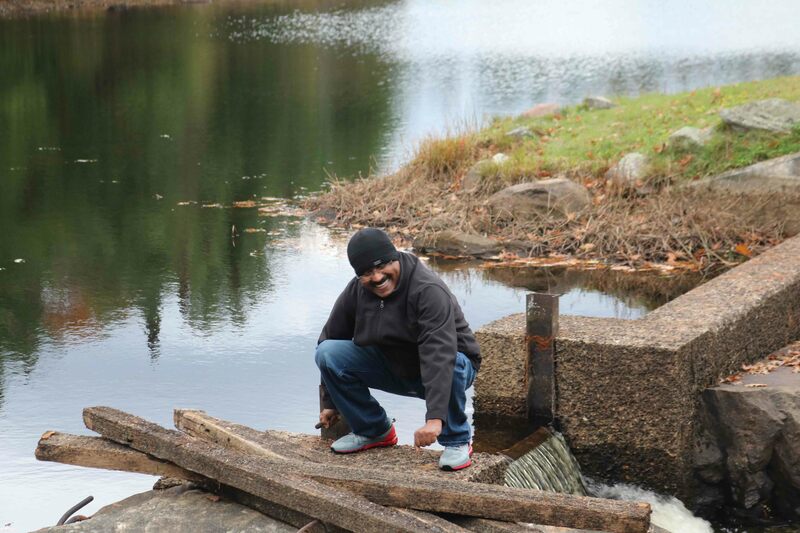 Most of the irrigation and flooding is carried out from these reservoirs with the water flowing down due to gravity. Come harvest time in the Fall and the bogs are flooded again to facilitate picking. 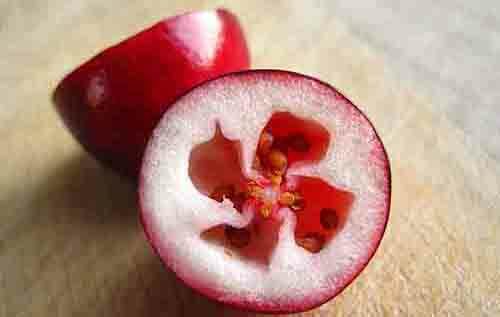 The cranberry fruit has four air pockets and hence they float in water. 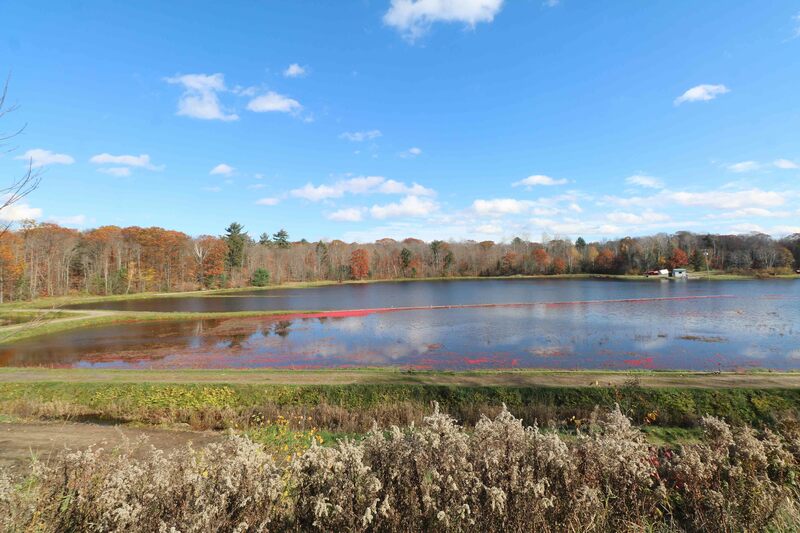 Once the bogs are flooded with about 2 feet of water, the vines holding the cranberry fruits rise up. A water reel picker now rakes the fruits off the vines. 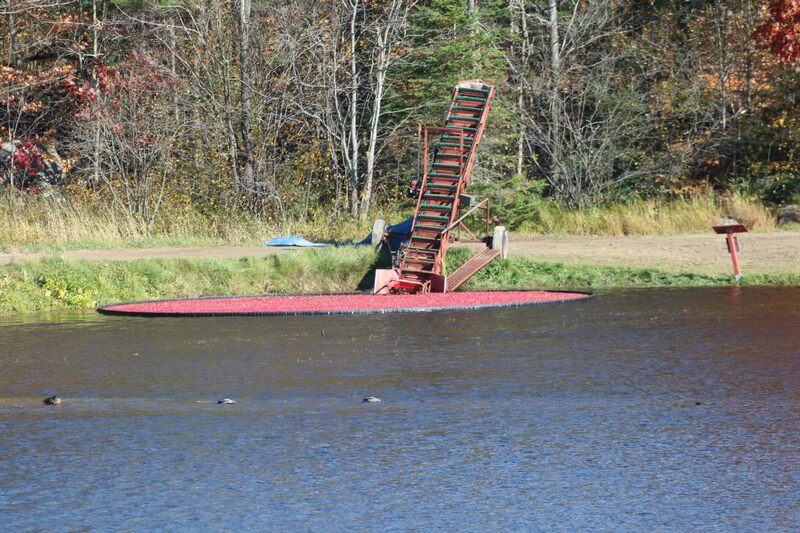 The cranberry fruits float up on the water surface as the picker moves ahead. This method ensures that the vines are not damaged while picking. 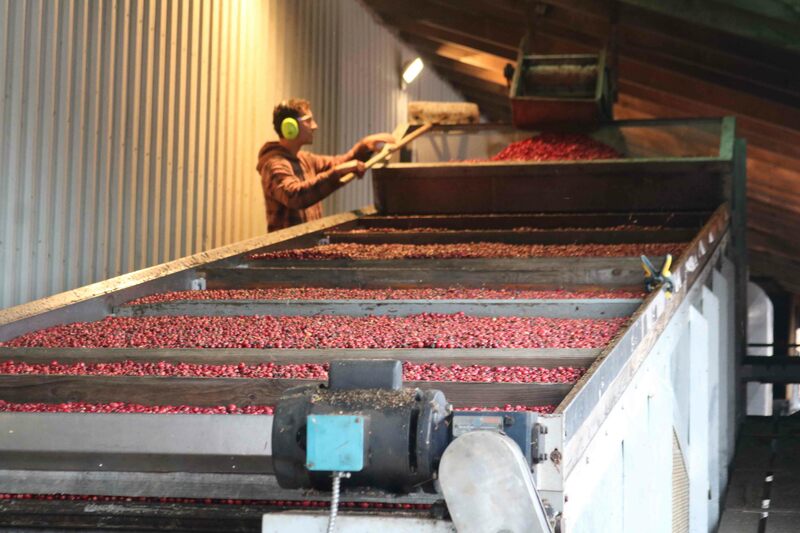 The red berries floating on top of the water are swept together with the help of a floating hosepipe and pumped into trucks to be taken to the packing plant for further processing. The truck carrying the cranberries from the bogs empty them into a hopper. From here begins the packing journey of the cranberries. 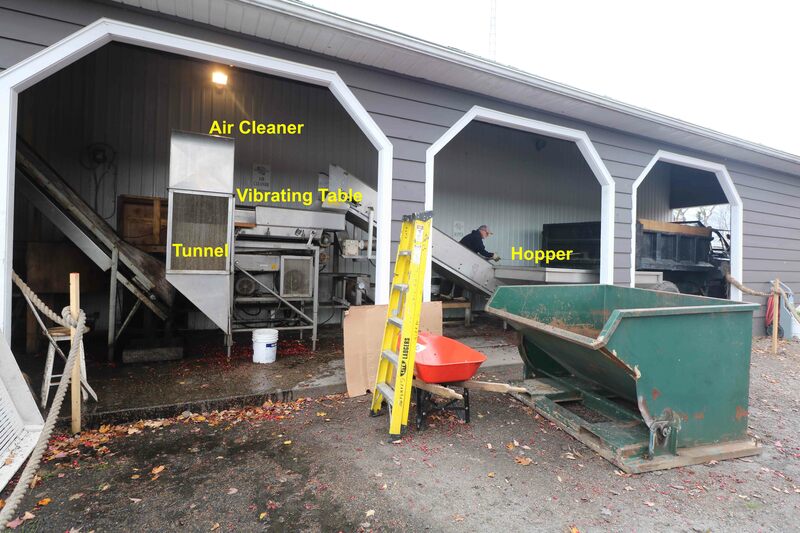 The cranberries now travel through a conveyer belt up to the Vibrating Table of the Air-Cleaner. The table has holes, adequate enough to let the cranberries pass through. The vines are collected here. From this table, the cranberries fall through a wind tunnel. The wind clears all the leaves. The cranberries again travel up a conveyer belt to the Dryer. The dryers houses a huge fan which blows cold air on to the cranberries. As the cranberries move from the top step to the bottom one, the forced cold air dries surface moisture off the fruits. This process last about one hour. Most of the cranberries are red, but there are white ones too. They are surely ripe ones. They are white because they did not get enough exposure to sunlight. The anthocyanin (red pigment) that gives red colour to these berries have not come out to the surface. Cooking or freezing these white cranberries will turn them Red. At the Johnston’s farm, they convert these white cranberries into their speciality product – White Cranberry Wine. It has become very popular and are an immediate sellout. The bogs are also flooded in winter to form a protective layer of ice over the vines. Sand is then placed on the ice, where it falls to the bog floor in spring, allowing the vines’ long runners to set roots. At the Johnston’s farm, they convert the bogs into a 10 km skiing and skating trail that wind around and through the 350 acre farm. The Johnstons run a Shop at their farm, open all year around. The shop sells fresh cranberries during harvest season and cranberry products like wines, crasins, jams, jellies, preserves etc through the year. The products are hand made by Mrs June Johnston and is sold as ‘Mrs J’s Preserves’. Mrs Johnston also and wrote a cookbook and is also available in the store. The farm also offers a tour of the farm aptly named ‘ Bog to Bottle Tour’. The tour commenced with a briefing about cranberry, its history, how the Johnston’s farm was established etc. Then we moved to the bogs to see how cranberry is grown and harvested. 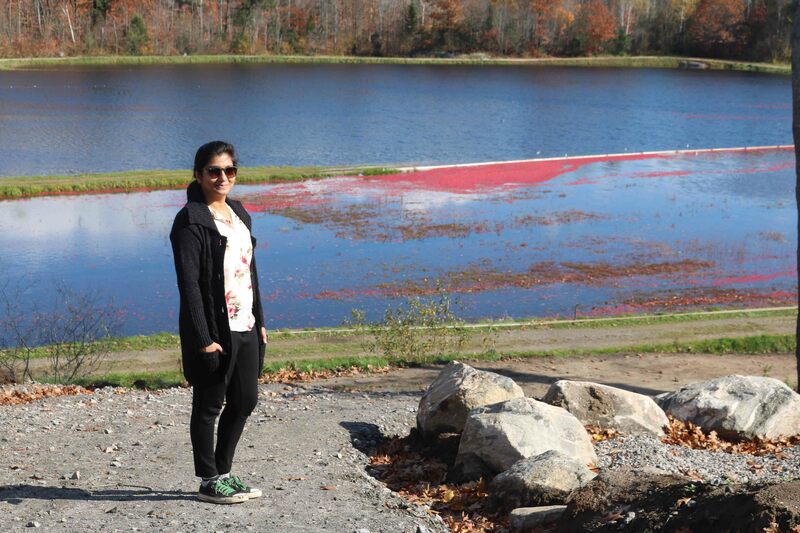 the tour gave many interesting insight into cranberry and its cultivation. 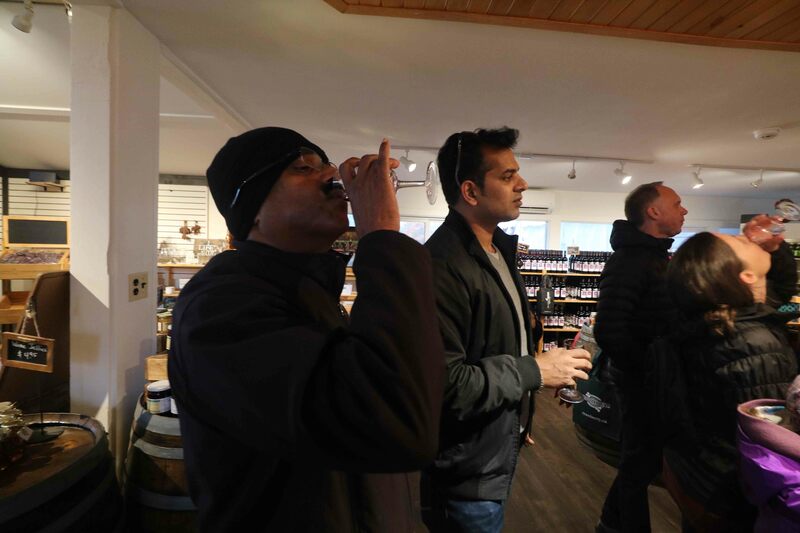 The tour ended at the shop with wine tasting. We tasted their famous Cranberry Wine, Blueberry Wine, Red Maple Dessert Wine and also their signature White Cranberry Wine. At the end we picked up a few bottles of wine to be taken home. As we bid goodbye to the Johnstons Farm, rain clouds had formed up in the sky. 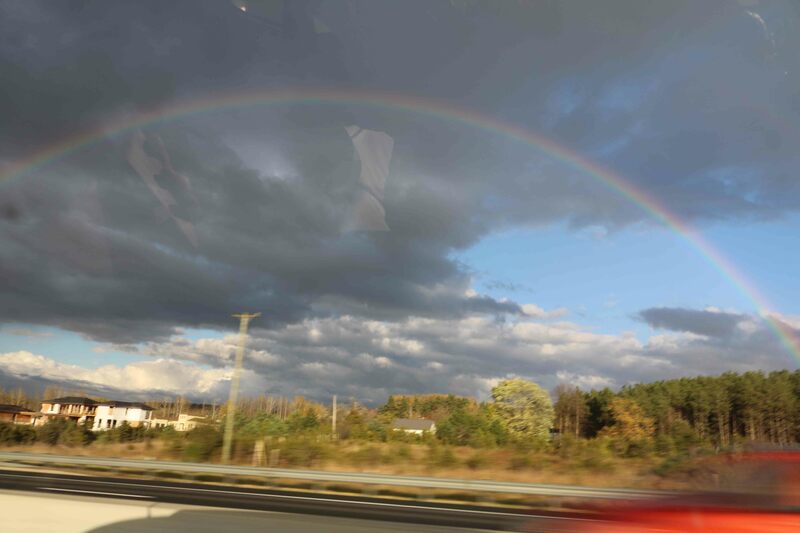 As we drove through the countryside, a huge rainbow appeared in the horizon. Might be wishing us all the luck for our next journey.